-Yes, our Non-GMO Organic Green Powder 180 is indeed certified organic by QAI and the USDA! We all know we need to eat fruits and vegetables to maintain health in our bodies, but did you know, the American Cancer Society recommends consuming five or MORE servings a day? While having a goal of consuming that many servings a day is great, how many of us actually achieve it every day... or even ONE time in the course of a week? Statistics show only 1 in 10 people get the suggested servings a day, that means 90% of us do not! Are YOU in the 90% every day? What about the high cost of produce at the supermarket today? We are not even talking about organic produce, which can cost 2 to 3 times the amount of chemical laden produce! Food costs continue to go up every year, while their nutrient value decreases. Who Has the Time to Juice Every Single Day? What if you could get the nutrients found in “organic” green vegetables, into your body in less than 60 seconds and at a fraction of the cost of buying a bag full of produce from the health food store? It's as easy as stirring a scoop of the Organic Green Power 180 into a glass with filtered water or fresh juice, then drink it down! "While some people enjoy juicing healthy green vegetables and the earthy taste that goes along with it, some folks just don't have the time every day but still want the great health benefits." Now You Can Have All the Health Benefits, Amazing Taste and No Mess to Clean Up! I feel more alive after I take my Organic Green Power 180 every morning, I mix it with filtered water and am out the door in a flash! It tastes fantastic, much better than other green foods I've tried. As a licensed health care practitioner, I am very particular about what I put in my body and what I recommend to my clients. I am very impressed with the Organic Green Power 180, as it has comprehensive whole food nutrition and outstanding flavor. Thank you so much for going the extra mile for your customers, I will be sure to spread the word. I am a business owner and operator so I am constantly on the go and I don't always get to eat what is best for me. Thanks for making your Organic Green Power 180, it keeps me energized all day long and I have felt an improvement in my digestion too, awesome product! So, Why Is It So Important to Alkalize Your Body? To be blunt, your blood pH (acid/alkaline balance) must stay within an extremely narrow range to avoid serious illness and even death! Thankfully, the body has built in mechanisms to maintain this delicate pH balance, BUT without enough alkalizing foods in our diet, we can't maintain the balance without stressing other systems in the body and ultimately our body falls prey to a dangerous acidic environment! By consuming alkalizing nutrients, like the ones found in our Organic Green Power 180, and by avoiding acidifying foods you are helping your body stay alkaline, therefore decreasing your risk of diseases found to be related to overly acidic cell chemistry. By the way, did you know you can monitor your pH level in 20 seconds, in the comfort of your own home, with a simple pH test strip procedure? Let's Look at the Amazing Organic Ingredients in Organic Green Power 180! - found to be very high in protein and fatty acids and also contain high contents of vitamins B, E, and beta carotene as well as selenium, zinc, manganese. 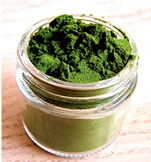 - Is high in chlorophyll and contains more calcium than cow's milk. - contains nutrients which may assist in normal red blood cell production and blood pressure regulation mechanisms. - High in Vitamin A which is needed for healthy skin, hair and eye function. - Research has shown it may assist in cleansing the blood and intestinal tract and assist in the elimination of toxic metals. - A good source of iron and folic acid, it also contains essential nutrients which help the body in cleansing and detoxification. - Apples can assist in lower blood fats through their soluble fiber content. - Found to provide high amounts of vitamin C, folic acid, Vitamin B6, manganese and potassium. - A powerful natural plant sweetener, its components may assist in healthy blood sugar regulation mechanisms. Organic Green Power 180 also contains digestive enzymes and organic probiotic cultures to assist in proper digestion and intestinal health. †The statements found on this web page have not been evaluated by the Food and Drug Administration. This product is not intended to diagnose, treat, cure, or prevent disease. Our product is the best Organic Green Food Powder available today! I love this product, it’s part of my daily nutrition!...I believe it keeps my immune system boosted at all times...I recommend this product to everyone, especially anyone that is in the public everyday...I also love their Ellagicaps...this is an excellent product also!! !...thank you BEST ON EARTH PRODUCTS for your excellence!...blessings! Absolutely love the taste. My plan is a major fast only drinking the green food powder. When you are 74 life has left you many aches and pains and by taking the green powder most of them are forgotten and minor, at half the price of the others on the internet yours is as good if not better. What I like about (green powder 180) is the healthy ingredients, And the taste like you can put one scoop in a cup of hot water and has a excellent taste and a smoothie with bananas strawberries blueberries with an excellent taste. With these healthy ingredients like (green powder 180) it gives your body a boost of energy. Anyone who is trying to be in an alkaline state needs a daily green drink. I love the green drink provided by Best on Earth, because it is organic, has a plethora of healthy ingredients and tastes delicious! My sugar loving friends will search it out to drink when they can't find anything made with sugar in my house. LOL!